Andrew Morrow Jr., retired from a career in the automotive industry to follow his dream of opening his own restaurant. Born in Jacksonville, FL his mother and seven siblings settled in the small town of Spartanburg, SC. Andrew's first fast food experience was working at the Beacon Drive-In where he began to have aspirations to open his own. He looked up to the late John B. White Sr. and often retells stories of their days working together. "He was a character. Just a brilliant man, watching him run his restaurant really inspired me and made me believe that I could do it." I always tell people when I hear there are a thousand hot dog joints out there, 'I'm sure Colonel Sanders (founder of KFC) was hearing a lot of that, too, when everyone was frying chicken,'" Morrow said. "I think you have to set yourself out if you want to be different. I want to have the best dog. Period." Leading with the focus of providing quality, great tasting food, and outstanding customer service, Andrew is on the track for bigger and better. "Hot dogs are just as much of an American fabric as apple pie and Chevrolet. God's been good. He guided me through all of this." 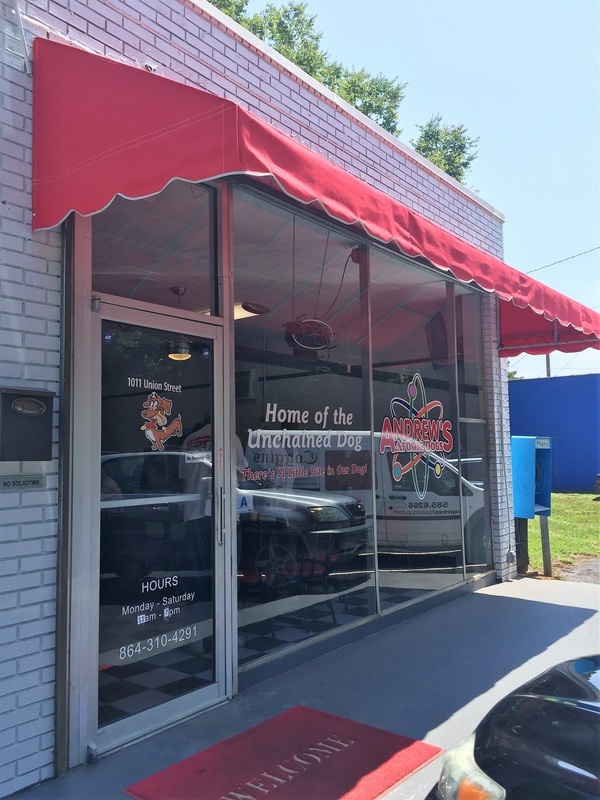 The owner/operator of Andrew's Atomic Dogs was featured on the CW and interviewed by Jamarcus Gaston. Check it out! Local blog site Hub City Bites featured Andrew's Atomic Dogs in honor of National Hot Dog Day! Check it out! Writer Daniel Gross, interviewed us on the second day of opening to get the scoop! Check it out! Come down and witness or yourself the best hot dogs in town!